This is quite a scarce version of the first edition VW Breakdown Truck in a strange colour that is a cross between avocado and, well, I’m not sure what really. It has cast spoke-effect wheels and there aren’t many of those around on this colour model. Unfortunately this one is missing the red plastic and chrome piece that fills the rear section. The suspension is also poor and there’s no hook. I could fix the hook and wire and even find a replacement tool box etc but there’s not much I can do about the suspension. Because it is so unusual, though, I can’t risk repairing it as then the wheels could have been swapped and it would no longer be an original example of the version. So it’s for sale at a modest price. It does actually look fine on display as you can see from the photos, the paintwork really being quite unmarked and the windows and wheels are good. 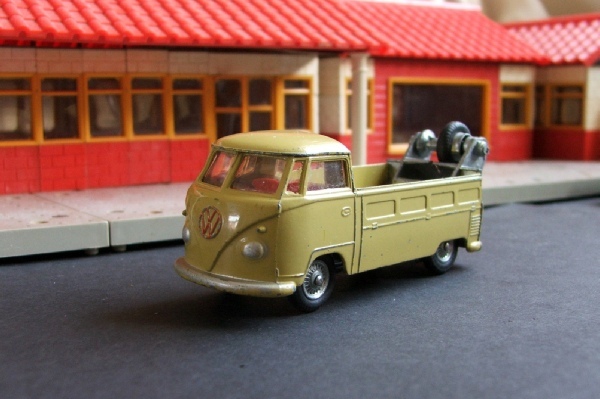 There is a later one with a Corgi logo and painted white, making an appearance with a trailer in various Racing sets.